PAT testing labels - unique design maximises safety. 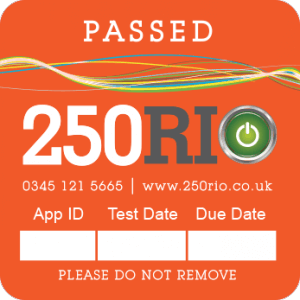 At 250 Rio we have developed a unique system of PAT testing labels, to provide our customers with a simple and effective way of ensuring their appliance testing is up to date and in accordance with their legal requirements. We have developed a colour coded label system that allows you to see test and renewal dates for every appliance we have tested, with the added benefit that a specific colour relates to a time frame – allowing customers to see at a glance which appliances are reaching their re-test date. 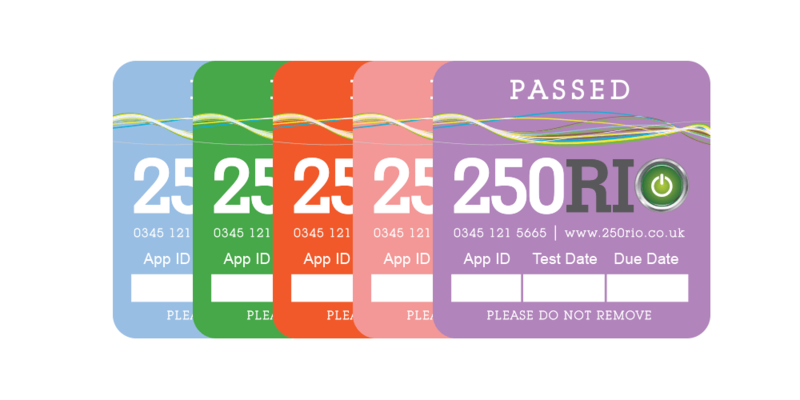 Why are PAT testing labels important? Every portable appliance for which you are responsible must carry a PAT testing label to prove that it has been tested within the recommended guidelines and gives an indication of when it should next be tested. This provides the employer with a fast way of auditing all appliances and gives employees the peace of mind that all electrical equipment with which they work are safe to use. Each item of electrical equipment is given an individual number (or we can use your asset number) and is identified with the sticker, indicating whether the item has passed or failed. We also provide a report, detailing the result of each test by item and a certificate is provided against which appliances can be checked. Any appliance that may have been introduced since the last test will therefore not have a label and be identified as requiring a test once it is over 12 months old. As time moves on we will identify with you which coloured stickers are in date and which are not – this gives a very quick way of assigning new test requirements, especially where previous tests have been carried out at different times or where equipment has been moved between offices etc. For further information of any aspect of our portable appliance testing service, please do not hesitate to contact us.